Page revised in August 2018. The locations covered in this section were visited in September 2012. And so soon as he (Cronus) had cut off the members (of Uranus) with flint and cast them from the land into the surging sea, they were swept away over the main a long time: and a white foam spread around them from the immortal flesh, and in it there grew a maiden. First she drew near holy Cythera, and from there, afterwards, she came to sea-girt Cyprus, and came forth an awful and lovely goddess, and grass grew up about her beneath her shapely feet. Her gods and men call Aphrodite, and the foam-born goddess and rich-crowned Cytherea, because she grew amid the foam, and Cytherea because she reached Cythera, and Cyprogenes because she was born in billowy Cyprus, and Philommedes because sprang from the members. And with her went Eros. 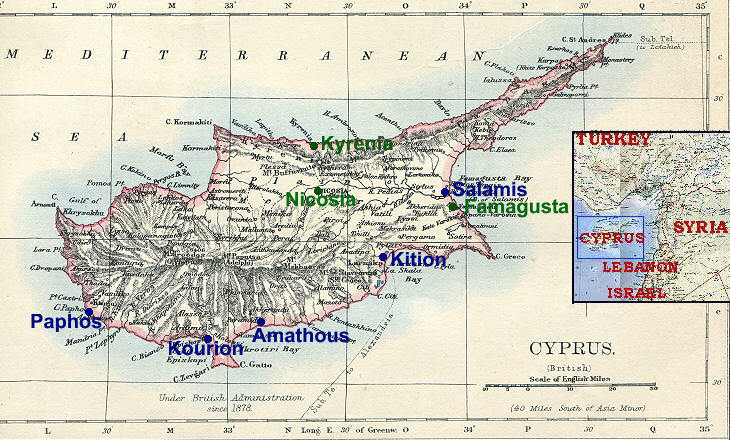 Cyprus is situated at the eastern end of the Mediterranean Sea opposite the coasts of today's Turkey and Syria. The first inhabitants came from the Asian mainland; archaeologists have found arrows and spears with obsidian heads at very ancient villages; because this stone was not available on Cyprus its presence indicates that trade with the mainland developed at a very early stage. It is uncertain whether the island gave its name to copper (Lat. cupra) or it was named after the metal which in the IVth millennium BC could be found in places on the surface of the earth. Later on it was mined in the Trodos Mountains and shipped in ingots from Enkomi (near Salamis). 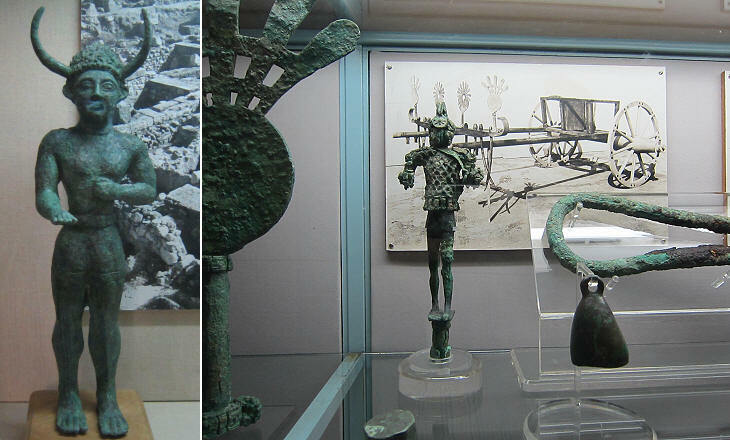 Bronze metallurgy was favoured by the availability of copper (but tin was imported) and many bronze artefacts have been found. 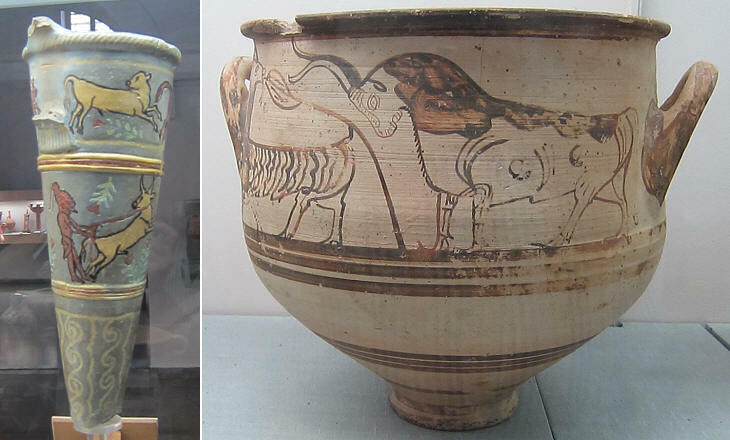 The development of pottery on Cyprus is due to contacts with Crete and Mycenae in Peloponnese. Owing to Greek influence a local fertility deity was associated with Aphrodite and shrines dedicated to the goddess were built at Palaia Paphos, Amathous and other locations. Similar to Greece, Cyprus was organized in city-states which occasionally grouped into a federation to face external threats. The first bulls were imported from Asia and the animal with its long horns became the object of worship similar to what occurred on Crete. It was probably seen as the king of the animals before being replaced in this role by the lion. 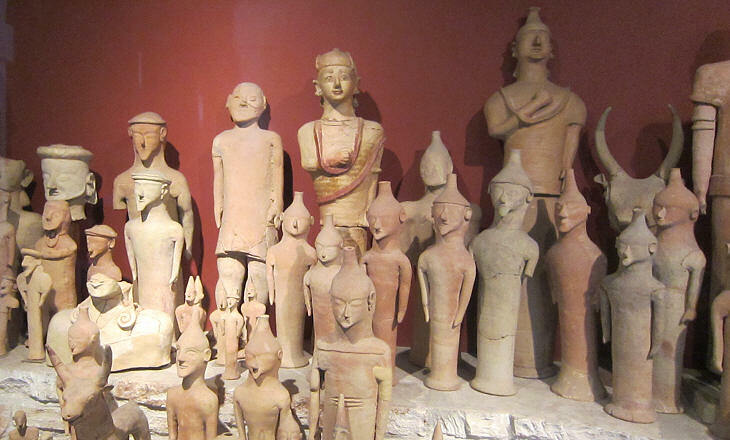 The city-states of Cyprus were forced to acknowledge the sovereignty of the great continental empires (Hittites, Egyptians, Assyrians), but this did not impact on the way they handled their internal matters. 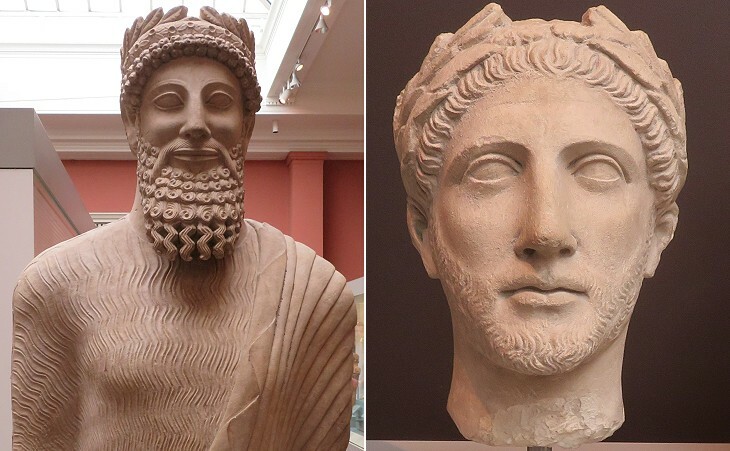 In the VIth century BC the Persians conquered Egypt, Syria and most of today's Turkey. 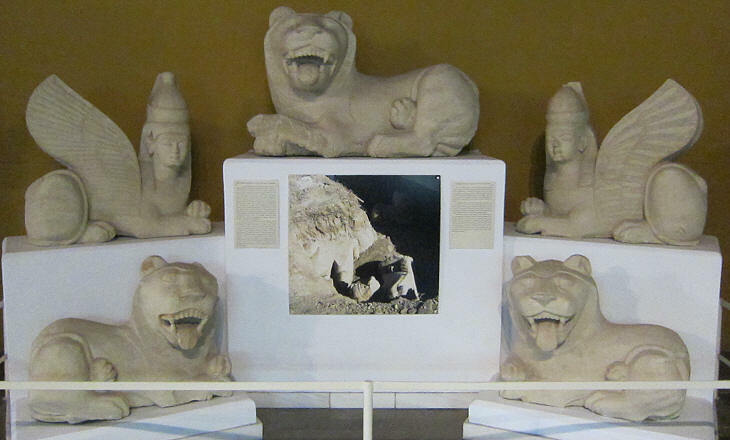 Cyprus became a battlefield between Greeks and Persians, with the former launching expeditions to occupy the city-states supporting the Persians. Although the Greeks were unable to occupy the island, Cyprus became more and more Hellenized and the Greek alphabet was adopted. In the late IVth century BC Alexander the Great defeated the Persians; the partition of his empire which occurred at his death assigned Egypt and Cyprus to Ptolemy I. In 58 BC Cyprus was included in the Roman province of Cilicia, but it was only after the defeat of Mark Antony and Cleopatra at Actium in 31 BC that the island was occupied by Roman legions. Cicero was one of the first governors of the province and when in Cyprus he resided at Paphos on the south-western coast of the island. 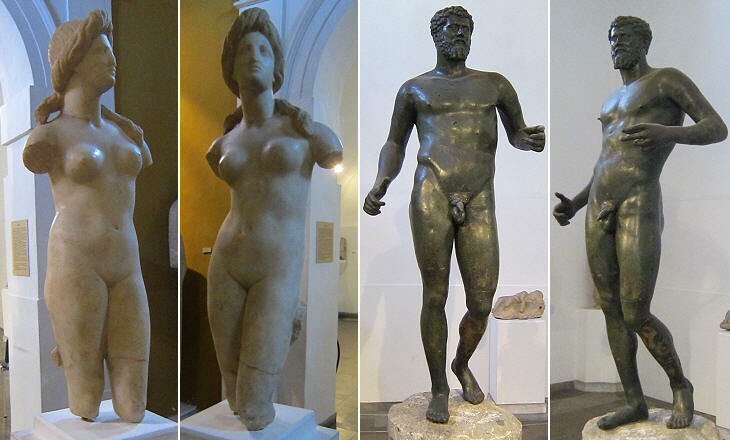 Most of the monuments and works of art shown in this section belong to the Roman period. 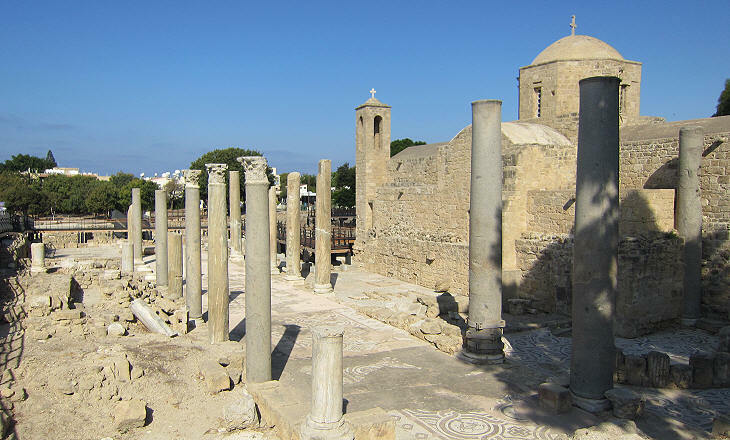 The main archaeological sites of Cyprus are situated on the southern and eastern coasts of the island. They provide a haven from the large sea resorts which were built in recent years. In general they are well maintained and have special facilities to allow close observation of mosaics without damaging them. 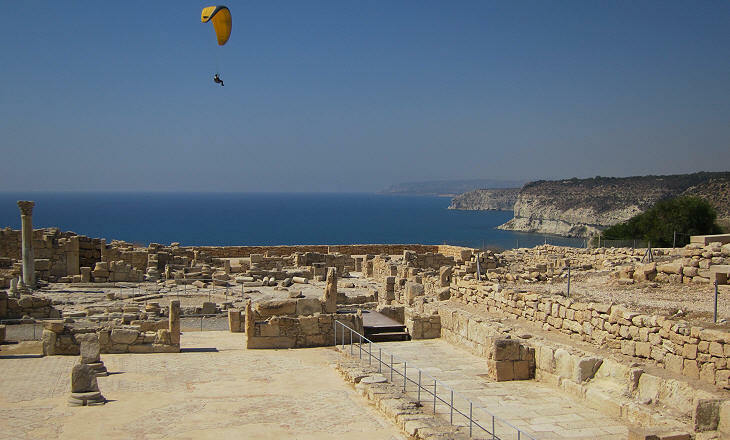 Unfortunately at Paphos, Kourion and Salamis the ruins of the ancient theatres have been replaced by modern structures. Some of the columns and capitals of the ancient towns can be found at early Byzantine churches or at Renaissance monuments built by the Venetians at Nicosia and Famagusta. 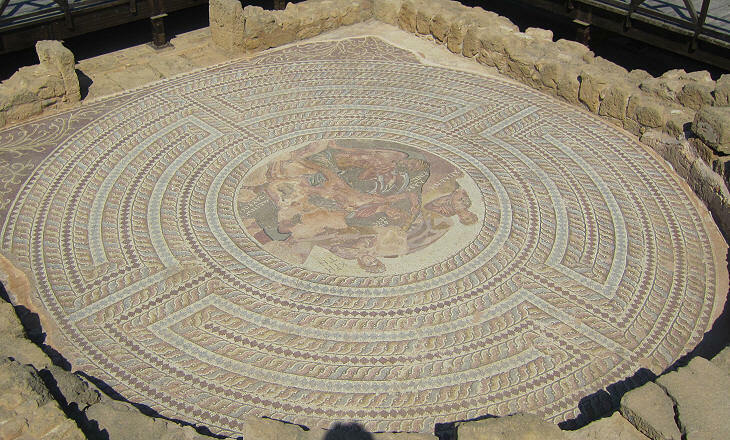 Coloured mosaics were widely employed to decorate the houses of wealthy people throughout the whole Roman Empire. The Museum of Antioch, one of the main cities of the Empire, displays an impressive collection of mosaics found on the mainland opposite Cyprus, but a group of houses found by chance at Paphos show that talented and skilled mosaicists were active on the island too. The image used as background for this page shows a detail of a column at Kourion.